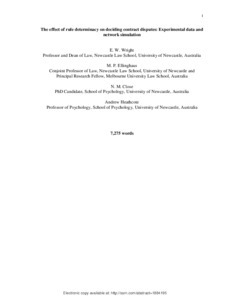 This paper reports the results of an experiment in which 107 law students who had completed their first year (including a course on Contracts) were asked to decide one of 6 contract law disputes. The experiment was designed to replicate and extend earlier experiments. The disputes were based on Australian appellate cases resulting in 2:1 majority decisions. Three of them were classified as relatively ‘easier’ and 3 as relatively ‘harder’ to decide, based on the earlier experiments. The participants were instructed to make their decisions using a statement of relevant law drawn from either Australian case law or the draft Australian Contract Code published by the Victorian Law Reform Commission in 1992. We sought to contrast two plausible points on the spectrum of ‘detailed rules’ to ‘broad rules’ that were as far apart as possible. At 4 points in the decision process (after reading the facts, after reading the law, after formulating the arguments for each party and after their decision) the participants were asked to rate the importance of 15 facts drawn from the statement of facts. These facts had been classified by the researchers into 3 categories, based on their relative weight under both law models. In the extensive scholarly literature on ‘rule determinacy’ it is nearly universally assumed that detailed rules are more predictable than broad rules. It is also commonly asserted that a reason detailed rules are more certain is that they focus the necessary factual inquiry on a relatively small number of important facts, whereas broad rules lead decision makers to give greater importance to a relatively wider range of facts. Despite their importance, these assumptions have scarcely been tested empirically. This study contributes to that task. Our experimental results indicate that, contrary to conventional wisdom, broad rules are as predictable as detailed rules, and are more predictable in some cases. They confirm conventional wisdom on the focusing effect of detailed rules. But this effect was not associated with greater predictability. If anything, it seemed to make some cases needlessly unpredictable. This paper also reports our attempt to explore the assumed relationship between the scope of the factual inquiry and predictability of decisions, using a connectionist-network model to simulate the decision and fact importance rating results observed in each of the six cases used in our experiment. The model accounts for over 99% of the variance in our experimental data, using only 5 parameters for each case to account for the results of both law model groups (18 data points). Our results support the hypothesis that, again contrary to conventional wisdom, narrowing the factual inquiry reduced rather than increased predictability in all but one case. We explore the implications and limitations of our findings in the conclusion. Our interest in this topic arises from its relevance to the codification and international harmonization of contract law. Our results suggest that resistance to contract codes, in jurisdictions like Australia and the UK, based on their indeterminacy lacks an empirical foundation. They also suggest that a global contract code based on commonalities that can readily be discerned in existing contract codes, particularly at the level of broad rules, could be an effective instrument of contract regulation.